Never been to Sandals Resorts but want to cash in on the awesome deals for past guests? Well now you can! New guests can now get 1 FREE night for a stay of 6 nights or longer within 60 days of their Wedding Anniversary. This is a great deal for couples who are married and haven't taken their honeymoon yet! We are happy to announce that Sandals Resorts will be launching a NEW FREE Anniversary Night promotion beginning Monday November 4, 2013! This promotion is designed for new guests who have never stayed at a Sandals or Beaches resort before and are looking to celebrate an anniversary at one of their resorts. 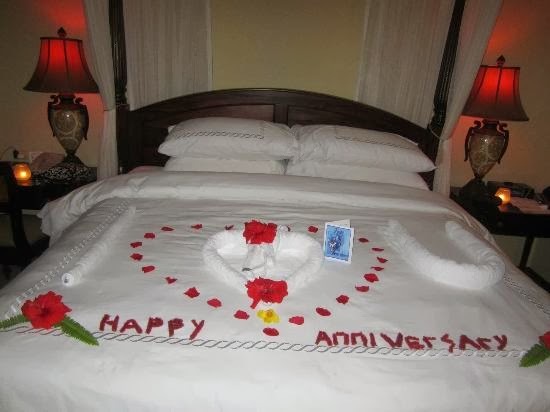 Promo Description: FREE night on couples Anniversary Stay when staying 6 nights or longer. Disclaimer: FREE Anniversary Night promotional offer is valid for bookings made between 11/1/13 and 03/31/14 for travel within 60 days of client's wedding anniversary. Blackout dates vary per resort. One anniversary night free with six (6) PAID nights, valid on premium room category and above; Upgrades and other room categories available at an additional cost. This offer is NOT available in the Deluxe room category. Proof of marriage license must be provided within seven (7) days of booking on the promotional registration page to qualify. Bookings will be adjusted to reflect the free night within 48-72 hours of receipt. This offer is for NEW guests only, is capacity controlled and may be changed or withdrawn at any time and without prior notice. This offer is not combinable with any Sandals Select Guest (SSG) promotions or SSG point offers and is not combinable with any other point offers through WorldPoints or Bank of America. This offer is not combinable with any other “free night” promotions. Restrictions may apply. Sandals® and Beaches® are registered trademarks. To book your Sandals resort vacation of 6 PAID nights or more call 1-888-FREE-MPP or email info@myparadiseplanner.com with your travel dates,resort, first and last names, and ages at the time of travel. 2. Register your booking. On the registration page, guests will be prompted for Last Name, First Name, booking #, check-in date, resort name (drop down list), email address, phone. 3. Upload your "proof of wedding date.” Once they complete the section above, they will be prompted to upload a copy of their marriage license with the typical button to find the file on their computer and then click the upload button which will highlight once file is available. Message of “Upload Successful!” will appear. Once upload is confirmed, booking will be adjusted by the reservations team. Staff will receive an email indicating that a complete registration has been received. They will adjust the corresponding booking and send an email to the email address on file for that booking (travel professional or direct guest) within 48-72 hours of receipt.